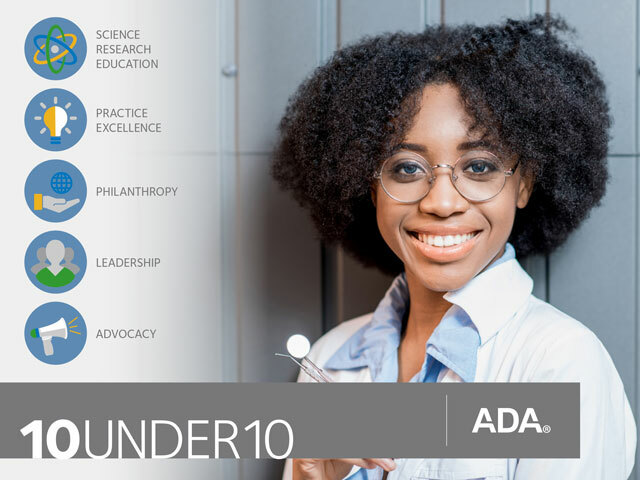 The American Dental Association is looking for new dentists who are already making a difference in the field to nominate them for the 10 Under 10 Awards. Nominees must be active members of the American Dental Association and graduated dental school between the years of 2009 and 2018. Those nominated should display excellences in areas such as philanthropy, science, leadership and advocacy. The deadline for nominations is Dec. 31, 2018, and winners are announced in spring 2019. The winners also receive a $1,000 gift card. The 2018 winners will be invited to accept their awards at the New Dentist Conference at ADA 2019 — America’s Dental Meeting, in San Francisco. For more information and to submit a nomination visit ADA.org/10Under10.